Plot Summary: The year is 2046. Haruyuki Arita is a young boy who finds himself on the lowest social rungs of his school. Ashamed of his miserable life, Haruyuki can only cope by indulging in virtual games. 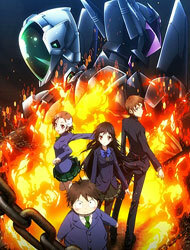 But that all changes when Kuroyukihime, the most popular girl in school, introduces him to a mysterious program called Brain Burst and a virtual reality called the Accel World.